There were a lot of babies born to Chicago Blackhawks this season and last, which meant the United Center ice started resembling a nursery. But the best thing about babies is that they usually fit perfectly inside the Stanley Cup bowl. Most of the players didn’t waste a second to get their kids into the nicest cradle they’ll ever rest in. This week it was Ames Richard Desjardins and Jaxson James Versteeg — oh, and don’t forget Austin Wolf Carcillo. These were the babies of the moment on Monday night, and if each of them found themselves, well, more or less stuffed into the Stanley Cup at Chicago’s noisy United Center in the on-ice aftermath of the Blackhawks decisive victory, they seemed to be enjoying themselves, some of them with the sensible aid of noise-cancelling headphones. 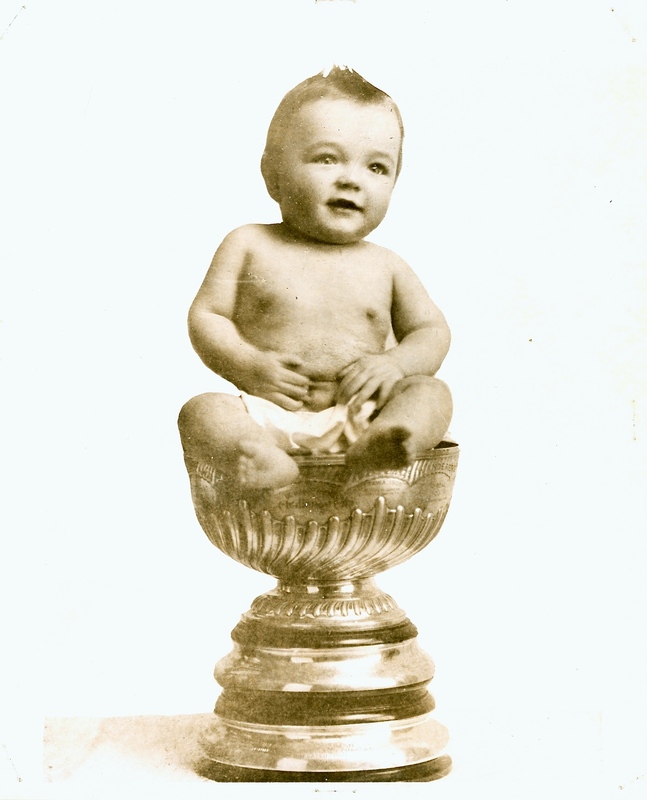 As Sports Illustrated, among others, has celebrated in recent days, these weren’t the first newishlyborns to find themselves posed by parents in hockey’s silvery championship trophy. If we don’t have a definitive diaper-count on just how many there have been over the years, can we trust that the Hockey Hall of Fame is on the case? In the meantime, we can say with what feels like certainty that in this photograph, above, we’re looking at the trailblazer in Marcel Vézina. There’s lots we don’t know about the boy and the circumstances of the portrait, but some things we do. He was the second son of Canadiens’ goaltending titan and legendary Cucumber of Chicoutimi, Georges Vézina. At this point, in 1917, he was about a year old and — well, obviously — a pretty happy kid. He didn’t have 21 brothers and sisters, despite what you can still read in several recent hockey histories, just the one older brother, Jean Jules. The story goes that Marcel’s middle name was Stanley, which would be great, if true, which it very well could be, though it doesn’t appear on the Dominion of Canada census that I’ve been looking at. Nor is a birthdate given there, so I can’t confirm that Marcel was born, as the story goes, on the night of March 30, 1916, as his father was repelling the pucks that helped the Canadiens to beat the Portland Rosebuds 2-1 and thereby the five-game series that won the team its very first Stanley Cup. It could very well be; I hope that’s true, too. If it is, the bad news for his father and the rest of the Canadiens was that by the time Marcel’s first birthday rolled around, the Cup was no longer theirs to hold high let alone burden with babies. On March 26, 1917, the Seattle Metropolitans beat Montreal 9-1 to take the series and the Stanley Cup for themselves.